Download "ROLE OF THE APEC SPECIALIST REGIONAL BODIES"
2 Why is the Standards and Conformance Infrastructure important? ~ Improves everyday life ~ Supports and foster new technologies ~ Underpins everyday commerce ~ Facilitates international trade ~ Provides the basis for investment The Standards and Conformance infrastructure, comprising metrology, standards and accreditation, and conformity assessment impacts on the simplest daily activities, such as the accuracy of an alarm clock, the way seatbelts in a car operate, and the safety of food. The same technical infrastructure also underpins the complex technologies and industrial processes that drive economic growth. Everyday commercial transactions and international trade could not take place without the support of an effective Standards and Conformance infrastructure. It provides the essential framework for industry and government to maintain domestic and foreign confidence in goods and services. It is also the key to enhancing global competitiveness, attracting investment, and fostering and supporting innovation. Why does Standards and Conformance infrastructure have such a pervasive effect on people s lives? What is the role of the key technical infrastructure bodies in the APEC region. Metrology Metrology (measurement standards) and traceability of measurement provide the basis for successful trade and commerce. They drive the continuous development of science, technology and industrial production. They are the foundation for all tests and measurements, including those associated with disease diagnosis and health care, food safety, forensic science, environmental monitoring, occupational health and safety, optimisation of production and consumer confidence and protection. Each economy has a fundamental reliance on its ability to demonstrate the reliability and accuracy of measurements. Government has a crucial role in maintaining and fostering the development of a rigorous and cohesive metrological system that links to international measurement standards and is responsive to changing technologies and international trade demands. Metrology is an integral component of the technical infrastructure value chain. National measurement standards provide the basis for a State s other conformity assessment activities like calibration services, trade metrology services, conformance testing with respect to technical regulations, testing, accreditation etc., in both the regulatory and the voluntary sectors. 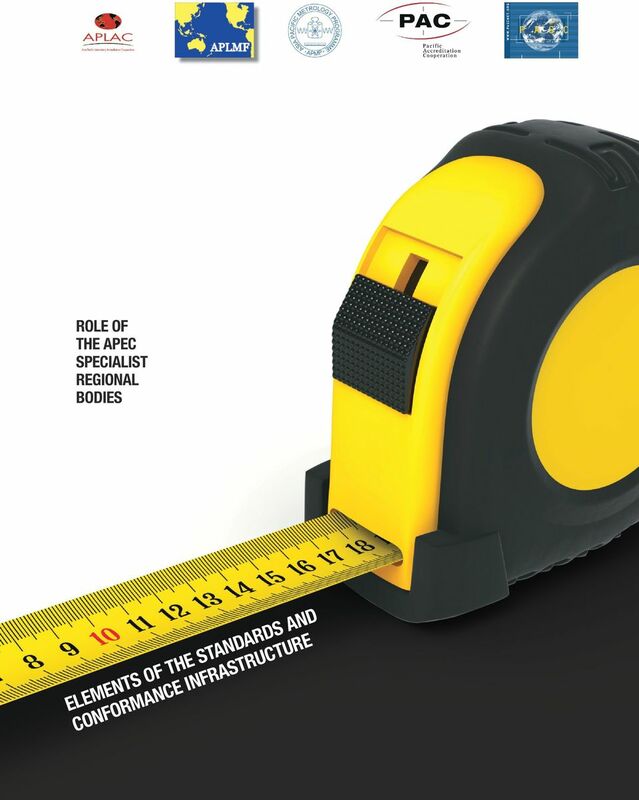 The National Metrology Institutes (NMIs) provide the direct link to the international measurement system, underpinning the credibility of the NMI s responsibilities in developing, maintaining and disseminating national measurement standards appropriate to national needs, and developing and transferring these to users in new measurement technologies. 1 Many metrological requirements are supported by legislation or regulation. These aspects become part of an economy s legal metrology system. An economy s ability to demonstrate compliance with international treaty obligations, for example, relating to trade or the environment, such as greenhouse gas reductions, depend on the robustness of its metrological infrastructure. Standards Standards, that is written or documentary standards include specifications, regulations and procedural requirements. Adherence to standards can be either to voluntary documents or to mandatory regulations and laws. Documentary standards are written by international organisations, national standards bodies, regulatory authorities, and trade and industry associations with the active participation of stakeholders including technical experts from industry, government, consumer groups and other affected parties. 1 See JCDCMAS Background paper 1. 3 Accreditation and Conformity Assessment Accreditation is a procedure by which an independent authoritative body (accreditation body) gives formal recognition that a (conformity assessment) body or a person is competent to carry out specific tasks. Accreditation involves the onsite peer assessment of conformity assessment bodies for their competence to carry out specified calibrations, tests, inspections and/or certifications of product on personnel, to determine if they meet a required standard. These conformity assessment activities are critical to the quality and accuracy of the many products and services upon which all economies rely for, among other things, the health and safety of its citizens, and for trade. Breaking down barriers to trade With the ongoing removal of tariff barriers to trade, emphasis by governments and by the World Trade Organisation on trade liberalisation has moved to consideration of non-tariff barriers. Among the most significant of these are national and international standards, and testing requirements that are not harmonised internationally. To help eliminate these non-tariff barriers, the key international and regional standards and conformance infrastructure bodies of the various economies have developed and maintained important bilateral and multilateral mutual recognition arrangements (MRAS) with their international peers. These arrangements underpin the government to government agreements signed between an economy and its key trading partners. Through these agreements, goods and services calibrated, tested, inspected or certified in one economy can be accepted by its trading partner economies. By obviating the need for re-calibration, re-testing, re-inspection or re-certification in the importing economy, such arrangements can reduce transaction costs, break down technical barriers and facilitate international trade. APEC economies are able to sign onto these MRAs through participation by relevant agencies within their economies in the standards and conformance infrastructure activities of the five APEC Specialist Regional Bodies (and related regional infrastructure bodies). 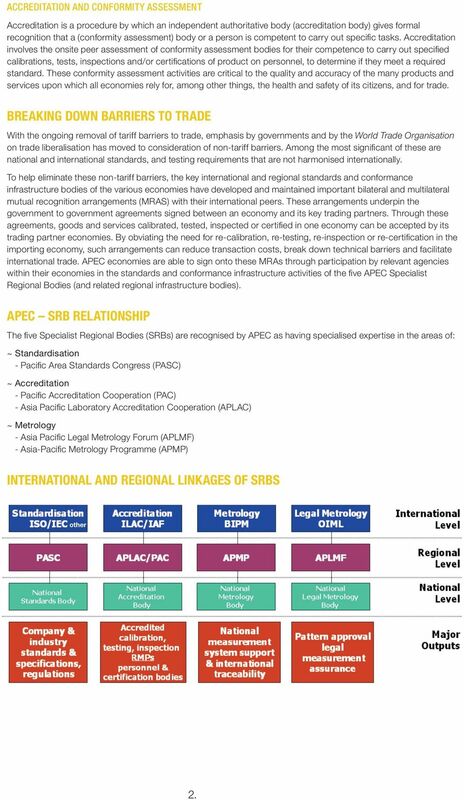 APEC SRB Relationship The five Specialist Regional Bodies (SRBs) are recognised by APEC as having specialised expertise in the areas of: ~ Standardisation - Pacific Area Standards Congress (PASC) ~ Accreditation - Pacific Accreditation Cooperation (PAC) - Asia Pacific Laboratory Accreditation Cooperation (APLAC) ~ Metrology - Asia Pacific Legal Metrology Forum (APLMF) - Asia-Pacific Metrology Programme (APMP) International and Regional Linkages of SRBs other 2. 4 Specialist Regional Bodies Asia Pacific Laboratory Accreditation Cooperation ( APLAC ) APLAC is a cooperation of accreditation bodies in the Asia Pacific region that accredit laboratories, inspection bodies and reference material producers. Its primary objectives are: - To provide a forum for exchange of information and to promote discussion among laboratory and inspection body accreditation bodies, and among organisations that are interested in laboratory and inspection body accreditation, and related activities. - To improve the standard of accreditation services provided by members. - To organise proficiency testing and related activities in the region. - To build up and to maintain mutual confidence in the technical competence of their accredited bodies among Full Members and to work towards further development of the APLAC multilateral mutual recognition arrangement (MRA). - To promote the mutual recognition arrangement among Full Members to other regional arrangements and individual national and regional accreditation bodies. - To promote international acceptance of test, calibration and inspection reports and other documents issued by laboratories, inspection bodies and reference material producers accredited by signatories to the APLAC MRA. - To cooperate with other national, regional and international bodies with similar or complementary objectives Accreditation is recognition by an authoritative body that an organisation or individual is competent to carry out specific tasks. APLAC members assess laboratories, inspection bodies and reference material producers against international standards, and accredit them as competent to carry out specific calibrations, tests or inspections, or to issue reference material certificates. This gives assurance that the calibration, test, inspection or reference material certificate results are accurate and valid. Assurance of accurate results contributes to the protection of public health and safety, to environmental protection and to trade facilitation. 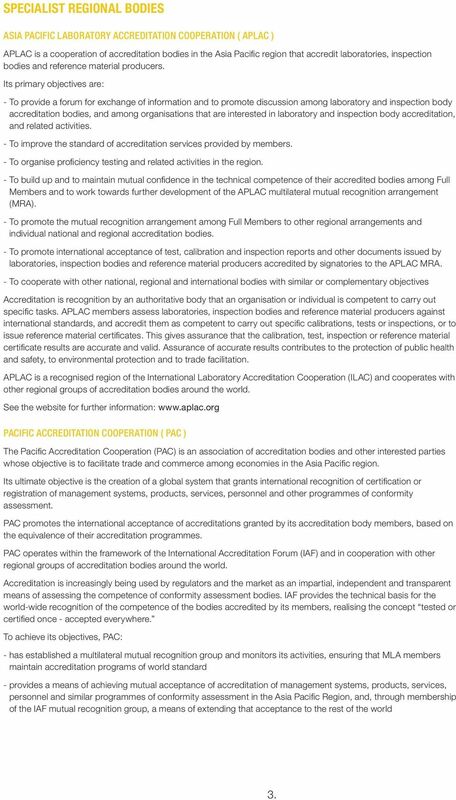 APLAC is a recognised region of the International Laboratory Accreditation Cooperation (ILAC) and cooperates with other regional groups of accreditation bodies around the world. See the website for further information: Pacific Accreditation Cooperation ( PAC ) The Pacific Accreditation Cooperation (PAC) is an association of accreditation bodies and other interested parties whose objective is to facilitate trade and commerce among economies in the Asia Pacific region. Its ultimate objective is the creation of a global system that grants international recognition of certification or registration of management systems, products, services, personnel and other programmes of conformity assessment. PAC promotes the international acceptance of accreditations granted by its accreditation body members, based on the equivalence of their accreditation programmes. PAC operates within the framework of the International Accreditation Forum (IAF) and in cooperation with other regional groups of accreditation bodies around the world. Accreditation is increasingly being used by regulators and the market as an impartial, independent and transparent means of assessing the competence of conformity assessment bodies. IAF provides the technical basis for the world-wide recognition of the competence of the bodies accredited by its members, realising the concept tested or certified once - accepted everywhere. To achieve its objectives, PAC: - has established a multilateral mutual recognition group and monitors its activities, ensuring that MLA members maintain accreditation programs of world standard - provides a means of achieving mutual acceptance of accreditation of management systems, products, services, personnel and similar programmes of conformity assessment in the Asia Pacific Region, and, through membership of the IAF mutual recognition group, a means of extending that acceptance to the rest of the world 3. 5 - promotes acceptance of certificates of conformity through multilateral mutual recognition among accreditation bodies in the region, and, by membership in the IAF mutual recognition group, extends that acceptance world-wide - encourages and supports the development of accreditation bodies in the region s economies - provides coverage for accreditation services in those economies where an accreditation body does not exist - provides a forum for achieving consensus among members on relevant accreditation and certification or registration issues - encourages support for, and participation in, conformity assessment activities of relevant international bodies - develops recommendations for liaison with relevant international bodies - encourages and facilitates the adoption and implementation of standards, guidelines and interpretative documents that have been developed by relevant international bodies - works with and complements the activities of other APEC regional bodies on standards, laboratory accreditation and metrology - facilitates collaboration, cooperation and mutual assistance among members, by means including seminars, meetings of experts and the sharing of information and experiences - supports APEC in achieving its mutual recognition goals within the region. See the website for further information: Asia Pacific Legal Metrology Forum ( APLMF ) The Asia Pacific Legal Metrology Forum (APLMF) is a grouping of legal metrology authorities in the Asia Pacific Economic Cooperation (APEC) economies and other economies on the Pacific Rim, whose objective is the development of legal metrology and the promotion of free and open trade in the region through the harmonisation and removal of technical or administrative barriers to trade in the field of legal metrology. The members intend to collaborate in APLMF to promote the coordination and integrity of legal metrology activities and services in order to achieve greater harmony of measurement and testing within the Asia Pacific Region and build mutual confidence in measurement between Members. Specific objectives are: - To identify and promote the removal of technical or administrative barriers to trade in the field of legal metrology. - To develop and maintain mutual confidence in measurement (metrological control) among legal metrology authorities in the Asia-Pacific region. - To provide a forum for exchange of information among legal metrology authorities. - To promote mutual recognition arrangements among Members and with other regional groups and individual economies. - To cooperate with the International Organization of Legal Metrology (OIML) and promote the use and acceptance of OIML International Recommendations and other publications and the OIML Certification System. - To collaborate with other regional bodies in the field of legal metrology. - To coordinate regional training courses in legal metrology and facilitate exchange of staff personnel among authorities. - To facilitate the provision of cooperation and assistance in the development of the legal metrology infrastructure of members. 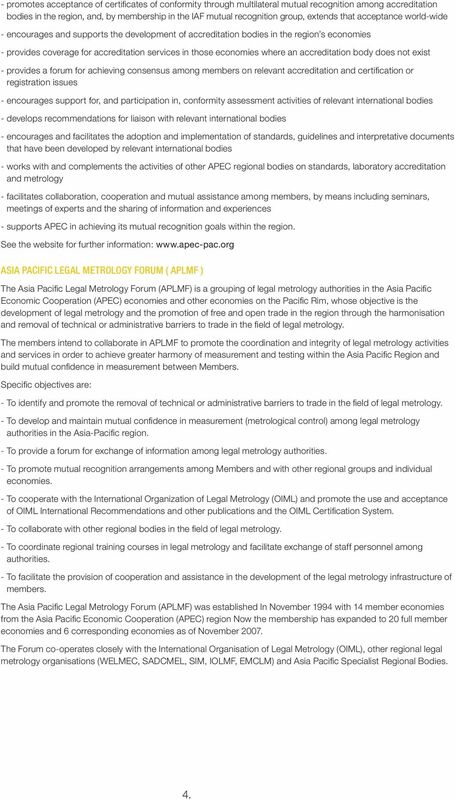 The Asia Pacific Legal Metrology Forum (APLMF) was established In November 1994 with 14 member economies from the Asia Pacific Economic Cooperation (APEC) region Now the membership has expanded to 20 full member economies and 6 corresponding economies as of November The Forum co-operates closely with the International Organisation of Legal Metrology (OIML), other regional legal metrology organisations (WELMEC, SADCMEL, SIM, IOLMF, EMCLM) and Asia Pacific Specialist Regional Bodies. 4. 6 As one of the regional organizations working in close liaison with the OIML, the APLMF promotes communication and interaction among the legal metrology organizations and seeks harmonization of legal metrology in the Asia- Pacific region. APLMF members have the ability to develop and maintain uniform test procedures (UTPs) to achieve their legal control of trade metrology according to the International Organization of Legal Metrology (OIML) regulations so as to facilitate future participation into the Mutual Acceptance Arrangement (MAA) framework on measuring instruments that was promoted by the OIML. See the website for further information: Asia-Pacific Metrology Programme ( APMP ) The Asia-Pacific Metrology Programme (APMP) is a collaboration between National Metrology Institutes (NMIs) to promote and support a measurement infrastructure in the Asia Pacific region that: ~ facilitates international trade ~ improves industrial efficiency and competitiveness ~ ensures sustainability ~ ensures equity in the marketplace ~ enhances the quality of life and the environment As of June 2008, the membership consists of thirty-four (34) organizations from twenty-two (22) economies, and six (6) organizations from six (6) economies that are Associate members. The objectives of APMP are as follows: 1. To develop and maintain collaborative networks that allow members to share strategic initiatives for informing stakeholders and improving regional measurement policies and investment decisions. 2. To improve the capabilities and effectiveness of member NMIs, particularly in developing economies, through awareness-raising, training and coordination of aid donors. 3. To improve the provision of traceability to all users within economies. 4. To ensure that all NMI standards in the region are traceable to the SI. 5. To support scientific collaboration on measurements for new technologies and to contribute to the ongoing development of the SI through the Metre Convention. Rapid technological development and industrial growth within the Asia Pacific region have placed increased demands on metrological services, and there is growing recognition of the importance of metrology to international trade through conformance testing and quality systems. 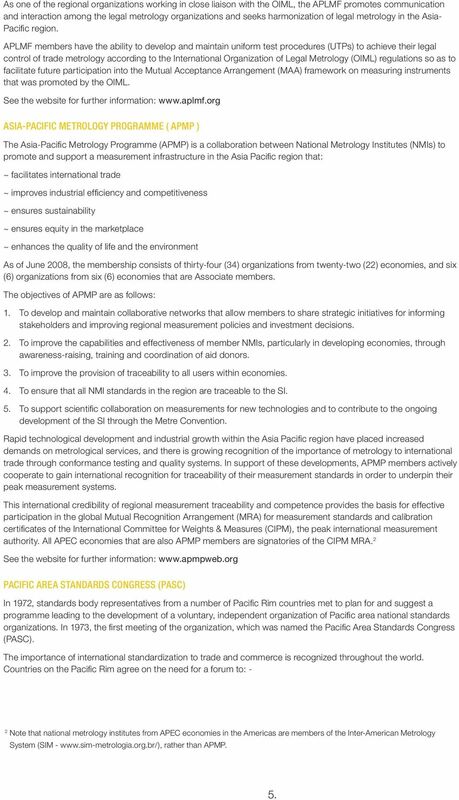 In support of these developments, APMP members actively cooperate to gain international recognition for traceability of their measurement standards in order to underpin their peak measurement systems. This international credibility of regional measurement traceability and competence provides the basis for effective participation in the global Mutual Recognition Arrangement (MRA) for measurement standards and calibration certificates of the International Committee for Weights & Measures (CIPM), the peak international measurement authority. All APEC economies that are also APMP members are signatories of the CIPM MRA. 2 See the website for further information: Pacific Area Standards Congress (PASC) In 1972, standards body representatives from a number of Pacific Rim countries met to plan for and suggest a programme leading to the development of a voluntary, independent organization of Pacific area national standards organizations. In 1973, the first meeting of the organization, which was named the Pacific Area Standards Congress (PASC). The importance of international standardization to trade and commerce is recognized throughout the world. 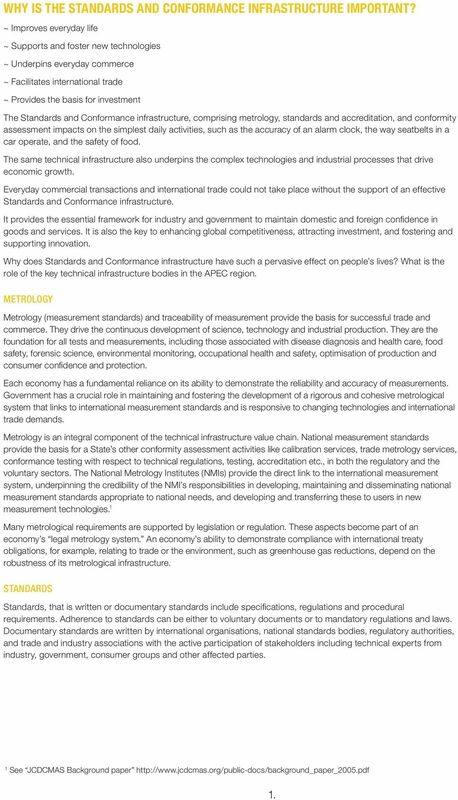 Countries on the Pacific Rim agree on the need for a forum to: - 2 Note that national metrology institutes from APEC economies in the Americas are members of the Inter-American Metrology System (SIM - rather than APMP. 5. 7 - strengthen international standardization programmes of the International Organization for Standardization (ISO) and the International Electrotechnical Commission (IEC) and to improve the ability of Pacific Rim standards organizations to participate in these programmes effectively - improve the quality and capacity of standardization in economies of the region - support free trade within the region and with economies in other regions - support improvement of economic efficiency and development of the region through the promotion of standardization - interact with other bodies that represent elements of the standardization technical infrastructure, industry, consumers and government The members of PASC have adopted by consensus a number of important resolutions concerning international standardization, the work of ISO and IEC, and communication and interrelationships among PASC members. PASC is concerned not only with standards preparation but also with conformance to standards. 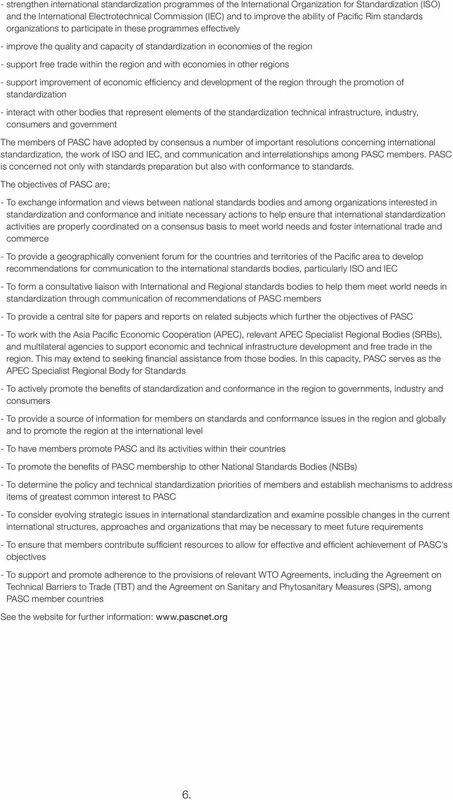 The objectives of PASC are; - To exchange information and views between national standards bodies and among organizations interested in standardization and conformance and initiate necessary actions to help ensure that international standardization activities are properly coordinated on a consensus basis to meet world needs and foster international trade and commerce - To provide a geographically convenient forum for the countries and territories of the Pacific area to develop recommendations for communication to the international standards bodies, particularly ISO and IEC - To form a consultative liaison with International and Regional standards bodies to help them meet world needs in standardization through communication of recommendations of PASC members - To provide a central site for papers and reports on related subjects which further the objectives of PASC - To work with the Asia Pacific Economic Cooperation (APEC), relevant APEC Specialist Regional Bodies (SRBs), and multilateral agencies to support economic and technical infrastructure development and free trade in the region. This may extend to seeking financial assistance from those bodies. In this capacity, PASC serves as the APEC Specialist Regional Body for Standards - To actively promote the benefits of standardization and conformance in the region to governments, industry and consumers - To provide a source of information for members on standards and conformance issues in the region and globally and to promote the region at the international level - To have members promote PASC and its activities within their countries - To promote the benefits of PASC membership to other National Standards Bodies (NSBs) - To determine the policy and technical standardization priorities of members and establish mechanisms to address items of greatest common interest to PASC - To consider evolving strategic issues in international standardization and examine possible changes in the current international structures, approaches and organizations that may be necessary to meet future requirements - To ensure that members contribute sufficient resources to allow for effective and efficient achievement of PASC s objectives - To support and promote adherence to the provisions of relevant WTO Agreements, including the Agreement on Technical Barriers to Trade (TBT) and the Agreement on Sanitary and Phytosanitary Measures (SPS), among PASC member countries See the website for further information: 6. CHAPTER 7 TECHNICAL BARRIERS TO TRADE Article 7.1 Definitions 1. For the purposes of this Chapter, TBT Agreement means the Agreement on Technical Barriers to Trade, which is part of the WTO Agreement. There is a need for a coordinating role by the Commission supported by the Framework programme, to facilitate and harmonise those developments. BELAC 1-03 Rev 4-2016 BELAC ACTIVITIES : DESCRIPTION AND CRITERIA FOR SELECTION The only valid versions of the documents of the BELAC management system are those available from the internet website (www.belac.fgov.be). Experis Gas Mixtures When accuracy, stability and reliability are a must Making the Difference For over 70 years, Air Products has enabled customers to become more productive, energy efficient and sustainable. 2) To promote the growth and development of the commercial and business sectors, with particular emphasis on the small business sector. The contribution of trade to a new EU growth strategy Ideas for a more open European economy Part 5 An EU Helpdesk for Trade and Investments By Unni Mannerheim THIS IS ONE OF EIGHT REPORTS IN A SERIES. for Vocational Education and Training (KRIVET) but the findings are not included in this paper.